Build machine learning models, natural language processing applications, and recommender systems with PySpark to solve various business challenges. 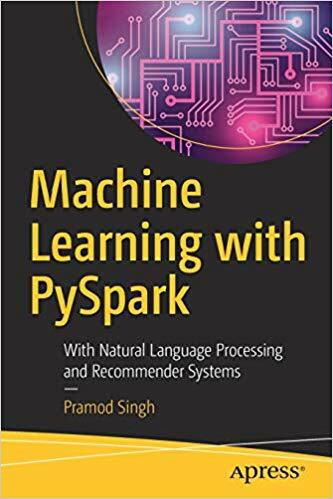 This book starts with the fundamentals of Spark and its evolution and then covers the entire spectrum of traditional machine learning algorithms along with natural language processing and recommender systems using PySpark. Machine Learning with PySpark shows you how to build supervised machine learning models such as linear regression, logistic regression, decision trees, and random forest. You’ll also see unsupervised machine learning models such as K-means and hierarchical clustering. A major portion of the book focuses on feature engineering to create useful features with PySpark to train the machine learning models. The natural language processing section covers text processing, text mining, and embedding for classification. After reading this book, you will understand how to use PySpark’s machine learning library to build and train various machine learning models. Additionally you’ll become comfortable with related PySpark components, such as data ingestion, data processing, and data analysis, that you can use to develop data-driven intelligent applications. Data science and machine learning professionals.